Penmon Point Lighthouse with Puffin Island . Anglesey’s most westerly point. I’d packed up and was out of the campsite by 7:15 am. 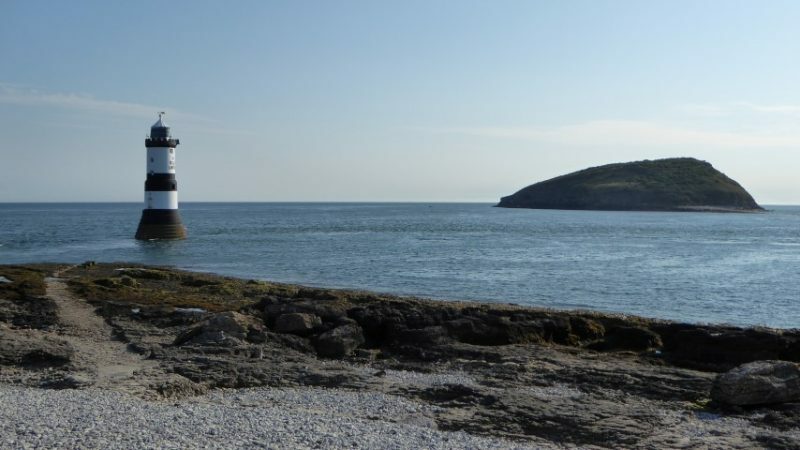 Another long, hot day was promised but before heading homeward, I visited the Penmon Point lighthouse; this is at the most westerly tip of Anglesey. I had hoped that it would be quite at that time of day but half a dozen camper vans had parked there overnight and several of them had managed to park as close to the shoreline as possible detracting and spoiling the natural beauty of the place. A few people were around and the sounds that I heard were those of the waves lapping against the rocks and the tolling of the bell buoy ringing its sad lament out in the channel between the Puffin Island and the shore. Nearby, I also heard the calls of terns as they tried, in vain, to deter a dog walker from trespassing on their beach. On the road back towards Beaumaris I had a scare as I hit a really nasty pothole whilst freewheeling downhill. This happened in a matter of seconds and I was just about able to regain control of my fully laden bike and prevent myself from hitting the tarmac. Had I hit the deck, it’s likely that the cost of an ambulance and my medical bill would have far exceeded the cost of the pothole repair. 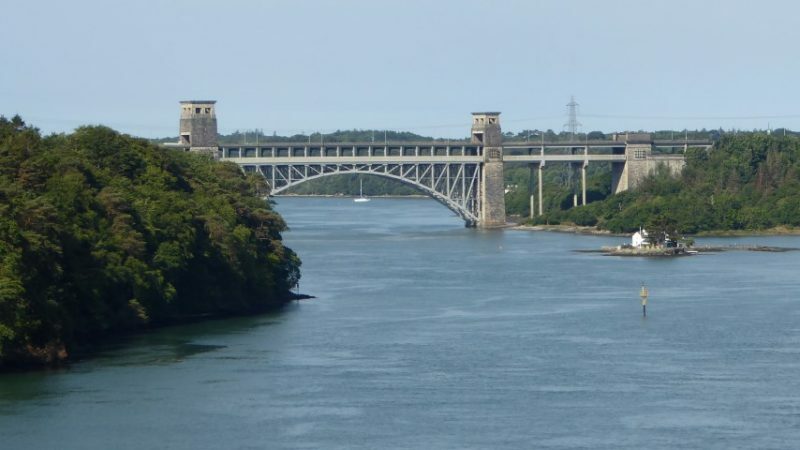 View of the Robert Stephenson’s Britannia Bridge from Thomas Telford’s Suspension Bridge. I pass through Beaumaris once more with its splendid castle and soon cover the five miles to Menai Bridge. I cross the straits on Telford’s suspension bridge and entered the city of Bangor where unfortunately I got myself lost. Again, I find that I’m unable to understand the road signs due to my lack of understanding the Welsh language. I compensated for this by having a full English breakfast at the local Morrison’s supermarket with two pots of tea. It’s the best meal I’ve had on my journey and a third of the cost of the one that I hadn’t enjoy the previous evening. From Bangor, national cycle route 5 (NCR5) contributes most of my route home and in fact passes within 100 yards of my door. At first NCR5 diced with the North Wales expressway and at one point it took me into the coastal hills giving me clear views back over the straits, to Penmon point, the lighthouse and Beaumaris castle. After a tea break at the Aber Falls tea room I passed through Penmaenmawr. NCR5 still kept the company of the expressway and here the road goes through a couple of tunnels, but the cycle path raises up and passes over the rocky outcrop for the first tunnel and then goes around the outside for the second tunnel. 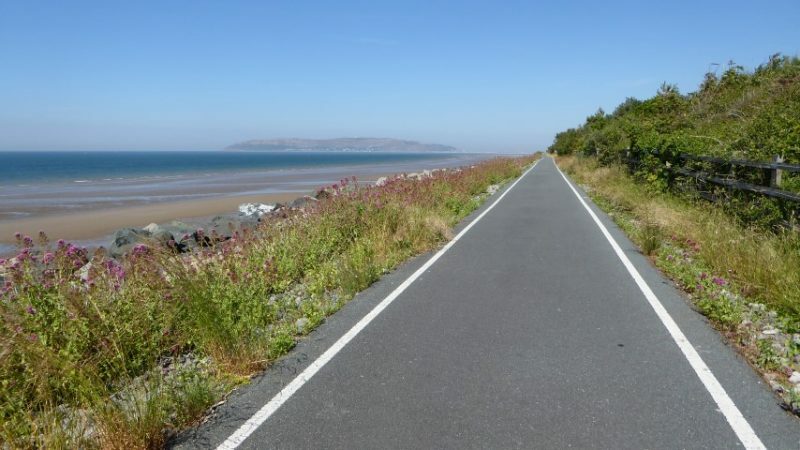 This has to be one of the most perfect coastal cycle paths. In my humble opinion. Near Penmaenmawr heading towards Llandudno with Great Orme on the horizon. Beyond Llandudno junction I cut across the base of peninsular and head for Rhos on Sea. The next stage was perhaps one of the most enjoyable and easiest sections of all. For 16 miles I remained on the coastal path as it took me through Colwyn Bay, Rhyl and Prestatyn. I was also fortunate to have the wind at my back. The cycling becomes easier despite the load that I carry I was clocking 12 to 14 miles per hour and only touching the brakes to slow down for pedestrians, other cyclist and dog walkers. I was still a long way from home but it’s almost a reward for the hard work, investment of energy, and sacrifice to the heat. This is a time that I will remember, and I’m happy and filled with the joy of cycling. As I continue through the dunes I see the Point Of Ayr lighthouse. Both Lighthouse and Beach along with an Old English Sheep dog once featured in a 2011 TV advert by a famous paint manufacturer. The failure of the paints resilience now stands as a testimony to the winter storms. The lighthouse looks forlorn, lonely and unloved and it has a slight list towards the setting sun. Built in 1776 and decommissioned in 1884, it is reputed to be haunted by a former lighthouse keeper called, Raymond. Point of Ayr lighthouse. Mainland Wales’s most northerly point. I have a childhood memory of charging down these dunes. I also remember exploring derelict timber holiday chalets. Deserted for many years, they were slowly being reclaimed by the sand. On a nearby hillside and amongst the trees I also remember the sound of a bell ringing at Talacre Abbey which, at that time, belonged to a closed order of Benedictine nuns. 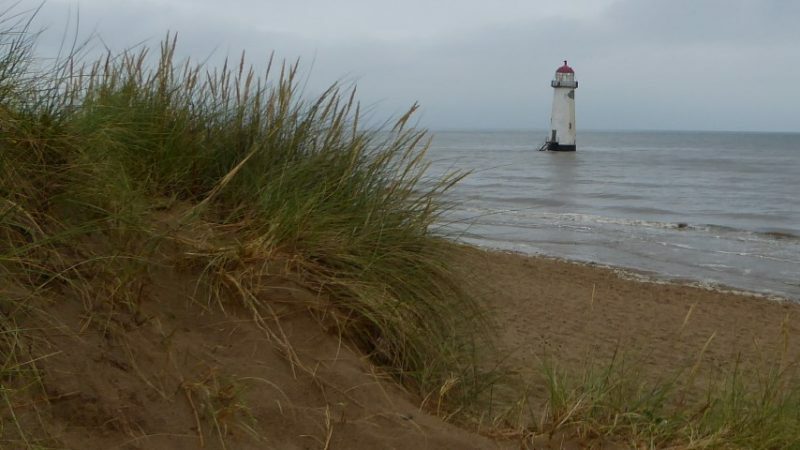 Point of Ayr was the site of one of the last mines in the North Wales coal field. Today, like many former industrial sites it has become a nature reserve. As I follow the path through the evening dusk I see the silhouette of a man and a horse. As I get closer I discover that it is a sculpture representing a miner with a pit pony. The last pony retired in 1968 and the mine closed in 1996. Further on, there is a piece of pit winding gear, this has been modified and now stands as another monument to the past. Eventually, the cycle path leads me back to a road and I join the A548. At 10 o’clock; I switch my cycle lights on. At Llannerch-y-Mor, I pass the silhouette of the Duke of Lancaster. This steam turbine ship has stood here for the last four decades. Its last role was as a Sealink car ferry shuttling across the Irish Sea. The road ahead of me is gloriously wide, flat, and quiet. The moon is up now and it is a full one in a clear night sky. The night was cool but not cold and although I was beginning to ache, I was still 20 miles from home. I felt like I was in a magical place as I headed towards Flint. I treasure and store each of these precious moments like childhood reminiscence. Beyond Flint, I countdown the towns as I press on through, Connah’s Quay, Shotton and Queensferry. At Drome corner, I join Sealand road, unlit, the road is dark but the full moon is all that I need as I cycle the remaining miles home. I arrived home at one a.m. and it was to be another hour before I fell exhausted into bed. I’d covered 90 miles over 18 hours, a not so spectacular five miles an hour average. I slept well!